Santiago, officially Santiago de Chile, is the federal capital of Chile, and the center of its largest metropolitan area, known as "Greater Santiago." It is situated at an elevation of 1,700 feet (520 m) in the country's central valley. While the city proper had a population just below 201,000 according to the 2002 census, the metropolitan area's population was estimated at 6,402,552. Although Santiago is the nation's capital city, legislative bodies meet in the nearby port city of Valparaíso. Approximately two decades of uninterrupted economic growth have transformed Santiago into one of Latin America's most sophisticated metropolitan areas, with extensive suburban development, dozens of shopping malls, and impressive high-rise architecture. The city also boasts some of Latin America's most spectacular infrastructure, such as the Santiago Metro and the sparkling new Costanera Norte, a highway system that passes below downtown and connects the eastern and western extremes of the city. 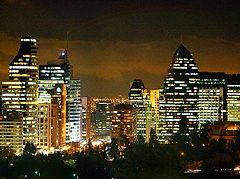 Santiago is headquarters to many major international companies and is a regional financial center. 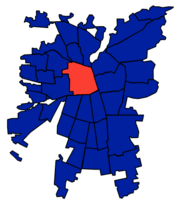 Throughout this article the term "Santiago" will normally refer to the Greater Santiago area; however, there are several other entities which bear the name of Santiago and need to be explained: The commune (comuna) of Santiago (sometimes referred to as Santiago Centro), is a subdivision of the Santiago Province, which is itself a subdivision of the Santiago Metropolitan Region. 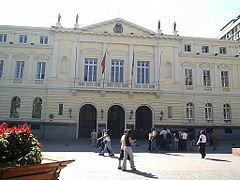 The commune is administered by the Santiago municipality (Municipalidad de Santiago), a separate legal entity with an elected mayor and council. It encompasses the oldest part of Greater Santiago, including downtown, and houses all major government infrastructure, including the government palace La Moneda. It has an area of 8.6 square miles (22.4 km²) and a population of 200,792 according to the 2002 census. Any references, other than to the Greater Santiago area, will define the area they relate to. 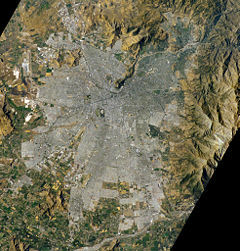 Santiago lies at 33' 27" South & 70' 40" West at an elevation of 522 meters (1,712 feet). The city lies in the center of the Santiago Basin, an enormous bowl-shaped valley consisting of a broad and fertile plain surrounded by mountains. It is flanked by the main chain of the Andes on the east and the Chilean Coastal Range on the west. On the north, it is bounded by the Cordón de Chacabuco, a transverse mountain range of the Andes, whereas at the southern border lies Angostura de Paine, a valley narrowing where an elongated spur of the Andes reaches nearly to the Coastal Range. Santiago Basin is part of the Intermediate Depression and is remarkably flat, interrupted only by a few hills. Among those hills are Cerro Renca, Cerro Blanco, and Cerro Santa Lucía. The Andes de Santiago is a massive mountainous system culminating in Tupungato volcano at 6,570 m (21,555 ft). Other volcanoes include Tupungatito, San José, and Maipo. Cerro El Plomo is the highest mountain visible from the Santiago urban area. The Mapocho River runs east to west through the city. 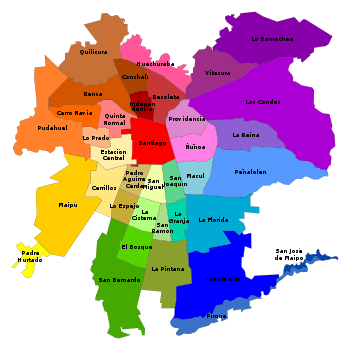 Santiago is divided into 13 political districts or comunas, with each having an elected mayor. The wealth, and therefore the quality of life, vary significantly among the comunas, with the wealthier comunas having modern buildings and well-tended public areas. The poorer comunas usually have unpaved roads and inadequate housing. 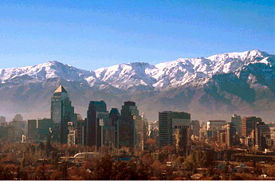 Santiago has a mild Mediterranean climate: Relatively hot dry summers (November to March) with temperatures reaching to 35 degrees Celsius (95 degrees Fahrenheit) on the hottest days; winters (June to August) are more humid, with typical maximum daily temperatures of 15 degrees Celsius (59 degrees Fahrenheit), and minimums of a few degrees above freezing. Occasional snowfall occurs on higher suburbs of the city. Mean rainfall is 312.5 mm (12.3 inches) per year. Thermal inversion (a meteorological phenomenon in which a layer of cooler air is trapped near the ground by a layer of warmer air above; when this occurs, normal air mixing almost ceases and pollutants are trapped in the lower layer) causes high levels of smog and air pollution to be trapped and concentrated within the Central Valley during winter months. Santiago was founded as Santiago del Nuevo Extremo (“Santiago of the New Frontier”) by the Spanish conquistador Pedro de Valdivia in 1541, on Huelén Hill (later renamed Saint Lucia Hill or Cerro Santa Lucía). Picunche Indians inhabited the area and were placed under the rule of the Spanish. This was the first permanent Spanish settlement in what is now Chile. Valdivia chose the location of Santiago because of its moderate climate and the ease with which it could be defended—Mapocho River then split into two branches around Huelen hill, and rejoined further downstream, forming an island. The city was destroyed on September 11, 1541, by native forces under the chief Michimalonco, but was immediately rebuilt at the same site. During the seventeenth and eighteenth centuries, Santiago enjoyed significant growth from immigration and the construction of many churches. Unfortunately, the high number of earthquakes left only a few of them standing: Iglesia de San Francisco (1618), which is still in use today; Velasco's residence (Casa de Manso de Velasco) (1730); the Posada del Corregidor (1750), and the house which once belonged to Mateo de Toro y Zambrano, known as the Casa Colorada today (1769). The city was slightly damaged during the War of Independence (1810–18), specifically during the Battle of Maipú, which was fought southwest of the city. After Chile's independence in 1818, Bernardo O'Higgins became the first Chilean head of state (“supreme director,” 1817–23) and declared Santiago as Chile's federal capital. The first buildings were erected with the help of the native Picunche Indians. The southern arm of the Mapocho River was drained and converted to a public promenade known as the Alameda (now Avenida Alameda Libertador Bernardo O'Higgins, the city's main avenue). During the early nineteenth century, Santiago remained a small town with few buildings other than Palacio de La Moneda, the building used as the Chilean mint during the Spanish period, and a few churches and other civic buildings. The Iglesia de la Compañía de Jesús caught fire during an 1863 church service, and 2,000 people perished, one of the worst modern fires. In the 1880s, extraction of nitrate fertilizer in northern Chile brought prosperity to the country, and promoted the capital city's development. Important landmarks were built in 1910, during the Centennial celebrations of independence from Spain, such as the National Library, the Museum of Fine Arts and the Mapocho Train Station (Estación Mapocho, now an events center). In the 1900s, the wealth from the nearby mines, including salt mines and nitrate mines, brought Santiago many new advances and prosperity. The Museum of Fine Arts was opened (1910) and, in 1913, the construction of the National Library began, the city's first newspapers and electric trams began servicing the city. Santiago began its transformation into a modern city in the 1930s, with the building of the neighborhood known as Barrio Cívico, which surrounds El Palacio de La Moneda. The city also grew in population, due to migration from the northern and southern areas of the country. Growth continued in the 1950s and 1960s, but radical political changes occurred in the 1970s. A socialist president, Salvador Allende, was elected democratically for the first time in history. Structural changes in the economy and reforms in society initiated by the government, with Allende at the head, led to the coup against the Chilean president on the September 11, 1973. Augusto Pinochet Ugarte then became president, followed by Patricio Aylwin, Eduardo Frei Montalva, and Ricardo Lagos. In 1985, an earthquake destroyed several historically significant buildings in the downtown area. Santiago is among the largest and most important financial centers in Latin America, ranking high as a Global City. Although Santiago is the official capital of the Republic of Chile, Valparaiso has been the seat of the Chilean congress since 1990. Greater Santiago extends throughout 37 municipalities (comuna) covering an area of 641.4 km² in 2002. The majority of Greater Santiago lies within the 32 municipalities of Santiago Province, but contains five additional peripheral municipalities located in the provinces of Cordillera, Maipo, and Talagante, to form the Greater Santiago conurbation. Each municipality in Chile is headed by a mayor (alcalde) elected by voters every four years. The members of the municipal council (concejales) are elected in the same election on a separate ballot. Buildings in Santiago de Chile. 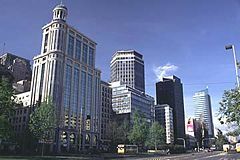 Santiago is the industrial and financial center of Chile and is home to the country's Stock Exchange, major banks, and much of the nation's industry. The city is one of the three major financial centers of South America, along with Buenos Aires and São Paulo. Some international institutions, such as ECLAC (Economic Commission for Latin America and the Caribbean), have their offices in Santiago. Many Santiago residents work in factories that process food, or manufacture textiles, footwear, or other products. Many others work in government and service industries. Metallurgy and copper mining are also important sectors of the city's economy. 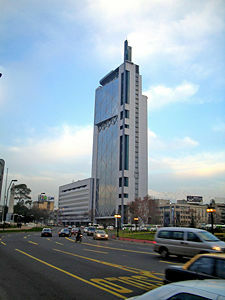 In recent years, due to the strong growth and stability of the Chilean economy, many multinational companies have chosen Santiago as the location for their headquarters in the region, such as Hewlett Packard, Reuters, JP Morgan, Intel, Coca-Cola, Unilever, Nestlé, Kodak, BHP Billiton, IBM, Motorola, Microsoft, Ford, Yahoo!, and many more. The construction sector is booming in Santiago. Several large apartment complexes are being built throughout the city and construction cranes are a common sight. The Costanera Center, a mega project in Santiago's Financial District, that includes a 5-story shopping mall, a 25-story hotel, and two 41-story office towers. 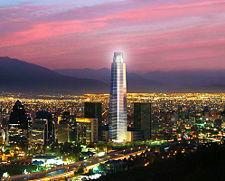 When completed in 2009, it will be the tallest building in Chile, at 853 feet (260 meters), and the tallest office building in South America. Near Costanera Center, another skyscraper is being built, Titanium La Portada, which will be 594 feet (181 m) tall. Although these are the two largest projects, there are many other office buildings under construction in Santiago, as well as hundreds of high-rise residential buildings spread throughout the metropolitan area. The population of Santiago's urban agglomeration grew from 0.982 million in 1940 to 2.82 million in 1970 and 4.75 million in 1992. According to the 2002 census, it contains a population of about 6.4 million, equivalent to approximately one-third of Chile's total population. Nearly 90 percent of Chile's population lives within 200 miles (320 km) of the Greater Santiago area. Santiago's residents predominately have Spanish ancestry, though some have French, German, Italian, or Croatian ancestry. American Indians and people from the Middle East and Korea also have significant populations in Santiago as do people of mixed white and Indian ancestry, or mestizos. Santiago's general basic education (EGB) is compulsory and lasts for eight years divided into two, four-year cycles. Students choose to specialize either in humanistic-scientific education (EMHC) or technical-professional education (EMTP). Students who successfully complete their secondary must then meet additional requirements to obtain tertiary education. Higher education is administered by the Division of Higher Education within the Ministry of Education and is provided by universities, professional institutes and technical training centers. The main coordinating bodies are the Consejo de Rectores de Universidades Chilenas for the state universities, and the Consejo Superior de Educación for private establishments. Higher education is not free, however students with limited resources may have access to higher education through funds allocated to universities in accordance with their enrollment of disadvantaged students. Among others, Santiago is the site of the University of Chile, founded in 1738, as the Royal University of San Felipe; the Catholic University of Chile (1888); the University of Santiago de Chile (1947); and the General Bernardo O'Higgins Military School (1817). Santiago has a very cosmopolitan cultural life, with strong European and North American influences evident in their native institutions. Music, theater, painting, and literature have enjoyed a resurgence recently, especially mestizo (combined Indian and European extraction) artisanship. 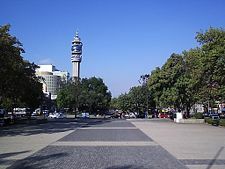 The city contains the National Archives, the Congress Building, the National Library, and the National Stadium. Santiago has two symphonic orchestras: Orquesta Filarmónica de Santiago, which performs in the Teatro Municipal and University of Chile's Orquesta Sinfónica that performs in the university's theater and various jazz establishments. Santiago's many museums include the National Historical Museum, with collections from the pre-Columbian, colonial, and independence periods; the National Museum of Fine Arts; the Contemporary Art Museum, in Forestal Park; the Art of the American Peoples Museum, with a collection of Chilean folk art; the National Museum of Natural History; the Natural History Museum of San Pedro Nolasco; and the Salvador Allende Museum of Solidarity, which features contemporary art by artists from around the world. Other points of interest include a zoological park, the sixteenth century cathedral, and the early nineteenth century Presidential Palace. Most of Chile's population is nominally Catholic and Santiago is no exception. According to the National Census, carried out in 2002 by the National Statistics Bureau (INE), in the Santiago Metropolitan Region, 3,129,249 people age 15 and older identified themselves as Catholics, equivalent to 68.7 percent of the total population, while 595,173 (13.1 percent) described themselves as Evangelical Protestants. Around 1.2 percent of the population declared to be Jehovah's Witnesses, while 0.9 percent identified themselves as Latter-day Saints (Mormons), 0.25 percent as Jewish, 0.03 as Muslims, and 0.11 as Orthodox Christians. Approximately 10.4 percent of the population of the Metropolitan Region stated that they were atheist or agnostic, while 5.4 percent stated they follow other religions. Football (soccer) is the most popular sport in Chile. Rugby union and tennis are also popular sports. The Chile national football team represents Chile in all major international football competitions. The team is controlled by the Federación de Fútbol de Chile which was established in 1895. They have appeared in seven FIFA World Cup tournaments culminating in their third place finish when they hosted the tournament in 1962, and a Bronze medal in the 2000 Summer Olympics in Sydney, Australia. 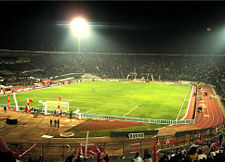 Satiago's Estadio Nacional de Chile has hosted the 1962 FIFA World Cup Final and the 1987 FIFA World Youth Championship and 4 Copa America finals. The traditional pastime of Chilean, rodeo, was declared a national sport of Chile in 1962. 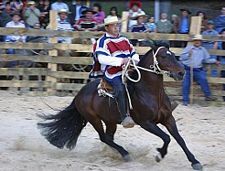 The Chilean rodeo is very different from the North American rodeo, with a greater emphasis on exceptional horsemanship. The Chilean rodeo is conducted in half moon arenas similar to corrals called the Media Luna. A steer enters the Media Luna and runs in one direction, while the competitors, or huasos, compete in teams of two and must pin the steer against the side of the arena and turn it in the opposite direction. The efficiency of the execution of the turn and huasos' "form" determines their overall score. Points are added or deducted for each turn, with the competition ending when the huasos have turned the steer three times. Chilean rodeos involve the entire community and are a festive celebration with a carnival like atmosphere and plenty of music, dancing and food. Santiago also has several ski areas within one to three hours drive in the Andes Mountains and surf and windsurfing beaches less than an hours drive west. Since the early 1990s, Chile's governmental National System of Health Services (Sistema Nacional de Servicios de Salud—SNSS) has organized and implemented the broad public health programs. Government funding and a contribution of 7 percent of taxable income funds the SNSS with access open to all Chileans, free of charge in the case of indigents and of those with income below certain levels. In 1992, Chilean health indicators rated their health care closer to industrial nations rather than to developing countries' health care systems. There are two medical schools in Santiago; Universidad de Chile, Facultad de Medicina in Casilla and Pontificia Univeridad Católica de Chile, Facultad de Medicina; and several large hospitals including, Hospital Clinico, Universidad de Chile, Hospital del Salvador, and Hospital Clinico, Universidad Catolica de Chile. Santiago is the center of the nation's railroad system. Highways and roads connect the city with the ports of San Antonio to the west and Valparaíso to the northwest, thus providing an outlet to the Pacific Ocean. Arturo Merino Benítez International Airport is Santiago's national and international airport with smaller domestic airports at Los Cerrillos, Lo Castillo and Tobalaba and a military airport at El Bosque. Trains operated by Chile's national railway, Empresa de los Ferrocarriles del Estado, connect Santiago to Temuco, in the central-southern part of the country. All such trains arrive and depart from Santiago's Estación Central ("Central Station"). "Metro" is Santiago's subway transportation system. It currently has five operating lines. Two subway lines (Line 4 and 4A) and an extension of Line 2 were inaugurated during late 2005 and 2006. The system is still under expansion, and extensions to Lines 1 and 5 are going to be built by 2009. Transantiago is the name of the city's public transport system. It was introduced in February 2007, and replaced the ad-hoc system run by thousands of independent bus operators. The new, integrated system combines local bus lines, trunk bus lines, and the underground metro network allowing passengers to make bus-to-bus or bus-to-metro transfers. The new system had an extremely rocky beginning, attracting criticism from the public and the media resulting in several riots and public displays of outrage by frustrated passengers who had expected a more extensive system. Toll roads, inter-urban free-flow highways, now connect the city's extremes, including the Vespucio Highway (which surrounds the city in a semi-circle), Autopista Central (which crosses the city in a North-South direction), and the Costanera Norte (which runs from the eastern edge, in Las Condes to the international airport and the highway to Valparaíso on the western side of the city). Santiago is served by two ports, San Antonio to the west and Valparaíso to the northwest. Panorama view of eastern Santiago from San Cristóbal hill. ↑ National Geographic Atlas of the World, Eighth Edition, Santiago, Chile. Retrieved October 20, 2007. ↑ World Weather Information Service, Santiago, Chile. Retrieved September 4, 2007. ↑ Encarta, Air pollution. Retrieved October 20, 2007. ↑ 4.0 4.1 4.2 4.3 Encyclopædia Britannica Online, Santiago. Retrieved April 23, 2008. ↑ 5.0 5.1 World Facts, Santiago. Retrieved October 21, 2007. ↑ Encyclopedia Britannica, Bernardo O'Higgins. Retrieved 21, 2007. ↑ Chilean Cultural Heritage Corporation, Brief report of the fire (Spanish). Retrieved October 20, 2007. ↑ World Book Encyclopedia, Santiago, Chile. Retrieved October 20, 2007. ↑ SkyscraperPage, Gran Torre Costanera. Retrieved October 20, 2007. ↑ SkyscraperPage, Santiago Construction Update. Retrieved October 21, 2007. ↑ Santiago, Chile, Education. Retrieved October 21, 2007. ↑ Instituto Nacional de Estadística(INE), Chile, 2002 Census—Spanish language. Retrieved April 23, 2008. ↑ Expediciones Chile, The Chilean Rodeo. Retrieved October 21, 2007. ↑ Country Studies, Health Programs. Retrieved October 21, 2007. Chile. 1999. Economic assistance: enterprise for the Americas initiative : agreement between the United States of America and Chile, signed at Santiago June 30, 1993. Washington, D.C.: Dept. of State. All links retrieved October 12, 2016. Santiago de Chile Daily Photo—A new photograph of Santiago every day. This page was last modified on 12 October 2016, at 15:52.